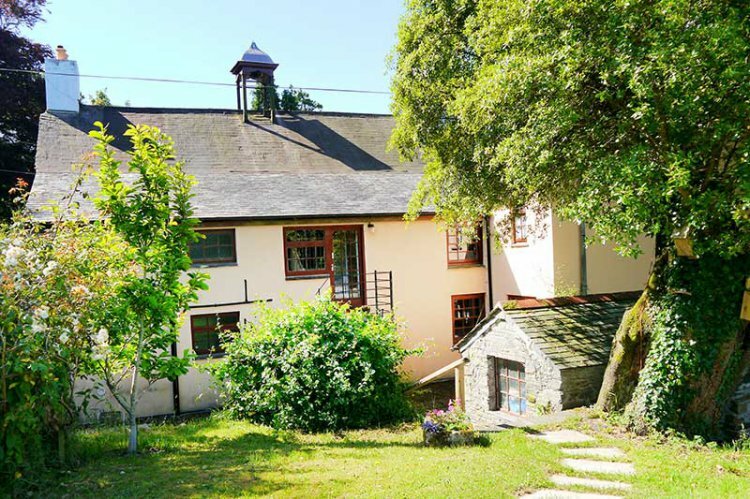 Bell Cottage is in the beautiful rural countryside just 1 mile outside the town of Callington in between Dartmoor and Bodmin Moor. The pubs, restaurants and shops of Callington are easily walkable in 10 minutes while the peace and tranquility of the setting are interrupted only by the sounds of the countryside. Public footpaths lead from the property and riverside walks are just a 10 minute stroll away. For more stimulating activities the restaurants, theatre and city centre shopping of Plymouth are just 30 minutes in the car, as are The Eden Project, the beaches at Looe and Polperro or the beauty of Dartmoor. Padstow on the North coast is an easy 45 minute car journey. The property is a large private apartment within the owners own house. From your private off-road parking space the property is accessed from the sheltered patio area via nine stone steps. The kitchen diner is spacious and fully equipped with an electric double oven, ceramic hob with extractor over, washer/dryer, microwave and a fridge with an ice box. A drop-leaf dining table and four chairs provides plenty of dining space. A couple of steps lead up to the landing with all other rooms off. On the landing is the original bell rope that is actually still attached to the bell on the roof! A quick pull will announce to the surrounding countryside that dinner is ready - just like when it was originally built! The newly fitted main bathroom off the landing is down three steps and has a corner bath with mixer shower over and matching toilet and handbasin with fitted vanity unit, mirror, light and shaver socket. Bedroom one is a large double en suite room with a super-king (6') double bed or the option of separate 3' single beds (please advise at time of booking if singles are required). There is an ornamental fireplace, bedside tables and lamps and built-in cupboards and wardrobes. The en suite shower room is down three steps with a double shower cubicle with mixer shower, matching toilet and handbasin with a built-in vanity unit, mirror, light and shaver socket. Bedroom two is a spacious double room with a king-size (5') double bed, bedside tables and lamps, TV with freeview, dressing table and a wardrobe. The large lounge has two, two seater sofas, an ornamental fireplace, coffee table, TV with freeview and DVD player. Outside is your private patio area and a large garden that the owners are happy for you to explore although young children should be supervised. The owners live in the main part of the house. Rental includes electricity, central heating, bedlinen, WiFi and towels. Regret no smoking and no pets.